The first game of the new season finished as a comfortable win for the home side. Matt Thompson was announced as a Sydney FC injury replacement signing just hours before kick-off, and promptly started as the right-sided central midfielder in a 4-3-3 formation. Frank Farina has so many injuries to deal with, that the starting team was near impossible to predict – including four debutants, with Richard Garcia starting as a left winger. There were also three new players in the back four – Marc Warren and Pedj Bojic started as the left and right full-backs, and Nikola Petkovic as a central defender. There has been less player turnover in Newcastle, and conversely, they had just two debutants: Kew Jailiens to the left of Connor Chapman in central defence, and Nathan Burns tucked in behind Adam Taggart of a 4-2-3-1 formation. Where else to start but the marquee man? There’s so much debate over whether Sydney can get the best out of him, and Farina has stressed repeatedly in pre-season that he’ll be moving him into a new position. “Alessandro is most dangerous in the final third. That’s where he creates and where he scores goals,” Farina told the Sydney Morning Herald. Therefore, he started at the apex of the 4-3-3, but without another striker to occupy the central defenders, he was often forced to wander across the pitch both into wide and deep positions – basically, a false nine, looking for space to receive the ball facing forwards. Within the confines of this particular formation battle, the space was to either side of Newcastle’s pivot midfielders, however, with the wide players dropping back to form a bank of four, it was difficult for Del Piero to get time on the ball – instead, he was frequently fouled with his back to goal. Del Piero’s bias to the left is obvious in the diagram above: with him, Garcia and Abbas all nominally occupying that zone, and Warren driving forward from full-back, Sydney often had five players in the left-hand side of the field – it was probably too congested, and although Joel Chianese and Pedj Bojic burst beyond Newcastle’s back four, there was a lack of penetrating runs in behind. 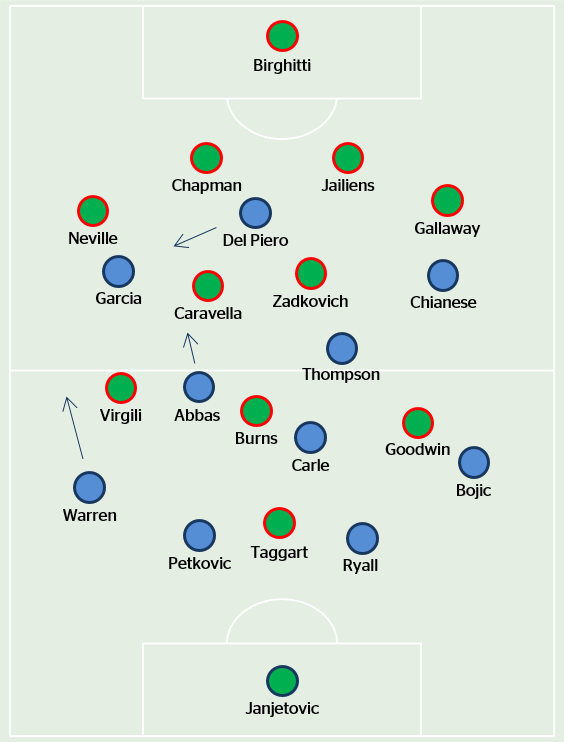 A false nine’s movement has to be complemented by reverse runs from other players – Sydney didn’t have enough of this: although Garcia played well on the left, they probably needed two, rather than one, wide forwards. Mitch Mallia and Yairo Yao might prove important players – their pacy, driving runs from out to in would help push defenders back and create more space for Del Piero. It was also interesting to see that Chianese took Del Piero’s central position out of position, with the rest of the side adjusting accordingly: it meant the fresher, quicker legs of Chianese could close down the central defenders, preventing easy passes forward and allowing the rest of the side to drop into shape, as well as decreasing Del Piero’s defensive workload. It was a clever move. A widely discussed topic in pre-season was Rado Vidosic’s defection from Brisbane to the capital – he’s worked with Farina before, and signed with the intent of “rebuilding the club”, so they could play more attractive, possession-based football. The major difference was the redeployment of Nicky Carle as a deep-lying midfielder – in pre-season, at the bottom of the midfield triangle, he dropped into defence to morph a back four into a back three – but there was no evidence of that here. He was one of the deeper midfielders, yes, but he was always firmly in front of the defence, receiving passes from the central defenders and looking to play forwards into the attackers. It was a much suitable tactic: Carle’s not a natural defender, but with freedom in deep positions his range of passing significantly improves Sydney’s ability to play out from the back – a major issue last season. However, this discussion has been all about Sydney’s tactics in long periods of possession, but the key feature of this match was their counter-attacks, the direct source of their two goals. The first goal essentially starts from a Newcastle attack, but as the ball is turned over, Thompson plays an excellent first-time pass into Del Piero, who’s free on the left flank. Naturally, the Italian does the rest. Again, Del Piero proves crucial for the second goal – he wins the initial ball, and eventually feeds Ali Abbas in space to his right for a cracking finish. Zenon Caravella’s involvement in both goals – for the first, some laughable defending, the second, he’s the one dispossessed – sums up Newcastle’s main weakness throughout the match. They dominated possession, but a lot of it was in the defensive third, with the two pivot midfielders (Caravella and Ruben Zadkovich) always forced backwards or sideways. Sydney’s pressing was important – they sat off somewhere around halfway, with Thompson and Abbas working to force their direct opponents backwards. Passes between the back six account for the game’s eight highest pass combinations – possession, but no penetration. Debutant Kew Jaliens showed an interesting ability to hit long, accurate straight balls towards the left flank, but his most frequent combination, with Chapman, also reveals Newcastle’s inability to work the ball into meaningful positions. The attacking trio rarely strayed from their positions, although Adam Taggart dropped deep to link up play. The wide players tucked into the channels and always wanted balls to feet as to take on the full-backs, while Nathan Burns’ movement between the lines was clever – but the real problem started in the aforementioned middle third possession. There was little progression throughout the match – the first three subs were all like-for-like changes (with James Brown pushing Burns out wide), while the eight-first minute switch of Jacob Pepper, a utility, for Connor Chapman signalled a switch to 3-4-3 formation – but we’ve seen this before, and with such little time remaining, it merely proved a minor footnote. Instead, this was all about Sydney – but even then, it’s hard to draw conclusions from the first game of the season. Whether the use of Carle as a midfielder, rather than a hybrid defender/midfielder, is the new template, or if it was a compromise in anticipation of competitive matches, remains to be seen. Newcastle, meanwhile, have lots to work on – allowances must be made for the first game of the season, but structurally, this wasn’t good: it was too easy for Sydney to shut down their play out from the back, and as a consequence, the attackers rarely received the ball in dangerous positions.